The State University of New York (SUNY) at Potsdam, one of America’s first 50 colleges and the oldest in the SUNY system. 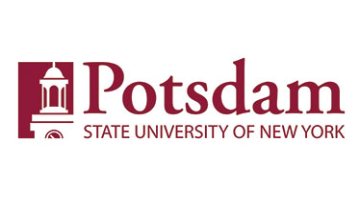 SUNY Potsdam, located on the outskirts of the beautiful Adirondack Park and an hour and a half from Lake Placid, was founded in 1816 as the St. Lawrence Academy. SUNY Potsdam currently enrolls 3487 students—3217 undergraduates and 270 graduate students. Home to the renowned Crane School of Music, SUNY Potsdam is known for its commitment to students’ development and success, challenging liberal arts and sciences core, excellence in teacher education, and leadership in the performing and visual arts. Offering more than 100 undergraduate majors and minors, along with interdisciplinary studies options, and 18 graduate majors, SUNY Potsdam offers an outstanding liberal arts experience. At SUNY Potsdam, about 35% of students self-identify as students of color, and thanks to its proximity to the U.S.-Canadian border and to the Akwesasne Mohawk reservation, the College is home to the System’s largest percentage of both Canadian students and Native American students.